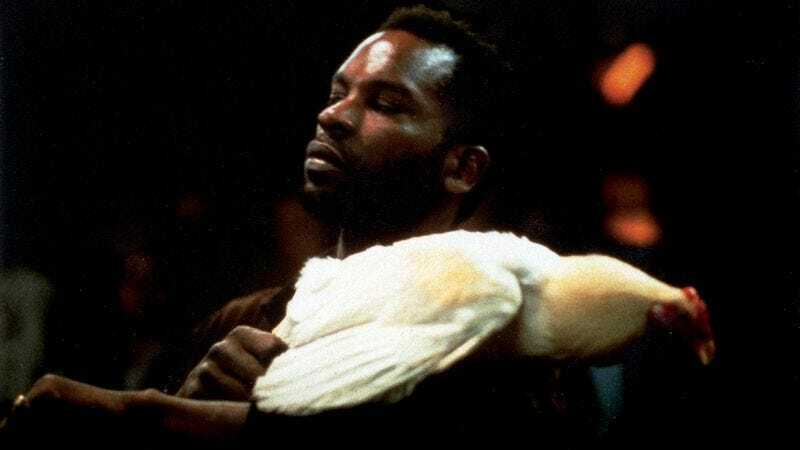 Claire Denis’ moody, existentialist sophomore feature No Fear, No Die reimagined film noir for the suburbs of Paris, as the story of two black men who become involved in a cockfighting ring. The setting is Rungis, a tiny borough just outside Orly Airport, known for its wholesale produce market—a low-rent underworld of illegal bets, middle-aged white guys, and nightclubs that look like warehouses from the outside. No Fear, No Die is gritty and loose enough to sometimes pass for documentary, yet it’s put together with a novella’s sense of theme and progression, owing more to Herman Melville—whose Billy Budd, Sailor would later be adapted by Denis as Beau Travail—than to Jean-Pierre Melville, the master of French noir. It deals in toxic struggles within groups, but is mentally claustrophobic; its repetitions and use of limited color (especially black and red) suggest a stammer in the brain. A lot of it takes place in a windowless basement, an underworld within an underworld. A bit about Denis: Though white and French, she was raised in Africa, in present-day Cameroon, Somalia, Djibouti, Côte D’Ivoire, Burkina Faso, and Senegal, the daughter of a colonial civil servant with strong pro-independence views. (Félix Houphouët-Boigny, the first president of Côte D’Ivoire, was a family friend.) Before she started writing and directing her own movies, she had a storied career as an assistant director and jack-of-all-trades; her name pops up in the credits of everything from Wings Of Desire to The Sacrifice. Apart from these two facts, which are inevitably read into all of her films, she is something of a mystery, about as private as a well-known filmmaker can get without being remotely reclusive. My anecdotal data suggests that she is the director most likely to show up at a film festival where she doesn’t have a movie playing; the interviews she gives tend be long and opinionated and full of personal stories that somehow still leave a lot of her biography blank. A late bloomer, she was already her mid-40s when she made No Fear, No Die. It’s a transitional work: her first dive into pulp and genre (she’d go on to make movies about serial killers, organ trafficking, and vampires, however obliquely), and her first time working with Alex Descas, a gifted actor who has appeared in many of her films. Tindersticks, the cult English band who now score all of Denis’ features, didn’t exist yet; Agnès Godard, her celebrated cinematographer, hadn’t yet been promoted from camera operator. Easier to follow than Denis’ later films, No Fear, No Die is also overtly concerned with character, even if it expresses itself mostly through bodies and silences. Its clipped visual compositions sometimes bring to mind a jazzier Robert Bresson, whose own Pickpocket is more of a genre piece than its reputation lets on, with shades of John Cassavetes’ The Killing Of A Chinese Bookie, one of Denis’ go-to reference points during the filming. No Fear, No Die, named after Jocelyn’s prized rooster, replaces the post-war setting of classic noir with a post-colonial one, swapping desperation for dislocation, and money troubles for racial tension. (After all, “noir” means “black.”) Maybe it speaks to the state of this generally screwed-up planet that the movie is just as current today as it was in 1990, when it first hit French theaters. Jocelyn and Dah—who hail, respectively, from the French Caribbean island of Martinique and the former French colony of Benin—lead a furtive existence, listening to “Buffalo Soldier” over and over and cooking meals on a camping stove in the basement hideaway furnished for them by mustachioed cockfighting nut Pierre (onetime French New Wave star Jean-Claude Brialy). The two emerge into the drab, industrial nowhere of Rugis mostly at night; in their white sneakers, baggy black turtlenecks, and oversized black overcoats, they suggest dapper specters. It would take a few more features for Denis to rise to prominence, which is part of the reason why No Fear, No Die has often gone overlooked, with spotty distribution as a contributing factor. One remarkable thing (of many) about the movie is the way it hits noir standbys without ever coming across as pastiche: the voice-over narration, the smoky score (by jazz pianist Abdullah Ibrahim), the clothing (Dah and Jocelyn’s secondhand overcoats). The movie establishes its bona fides right at the start, opening with an epigraph from Chester Himes, a superb writer best known for his Harlem crime novels. It goes: “Every human being, whatever his race, nationality, religion, or politics, is capable of anything and everything.” The quote—a riddle, given No Fear, No Die’s pessimism—appears twice, first as white text over a black screen, properly attributed, and then soon after, spoken in voice-over by Dah, who says that he can’t remember where he read it. The not-remembering part is key; it’s the one moment where the movie gives itself away as an attempt to de-familiarize a genre. It strips away the established context—the gumshoes, two-timers, and fedoras—and, as a result, gives noir’s fatalism new meaning. It re-sharpens a dulled edge, and makes sharp cuts. Next guest: Between Halloween and The Fog, John Carpenter directed the superlative two-part TV movie Elvis, starring Kurt Russell as Elvis Presley.